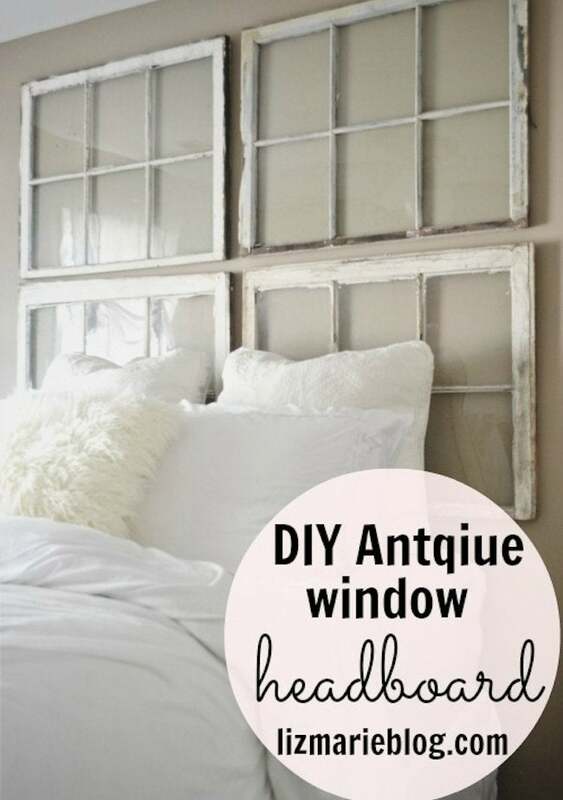 These thrift store windows bring new life to a guest bedroom as a simple repurposed headboard. At BobVila.com, we love an old window. No, really. 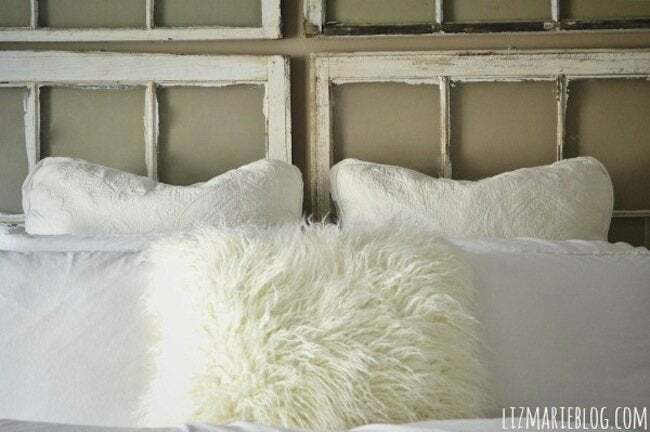 And this repurposed window headboard from Liz Marie puts one of our favorite materials on full display. By letting their natural window-ness shine through (see what we did there? ), she ended up with a headboard that elevates a potentially ordinary guest bedroom to cottage chic. So if you have some spare windows left over from a remodel or are lucky enough to find some at the local thrift store, read on and get ready to be inspired. I found these windows at a local thrift store for a price that I could not pass up. I loved that they were all similar and knew right away what I wanted to do with them. I also loved all of the flaws in the windows & didn’t want to change them in any way. This headboard was quite simple to hang & only required a few steps to make sure it was secure & ready for guests. I am not going to lie, having windows hanging above a bed wasn’t my safest idea ever so I wanted to make sure things were as secure as possible. 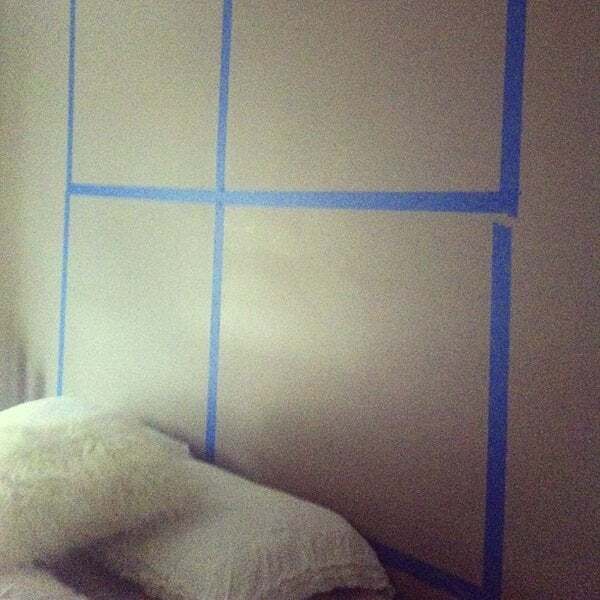 We taped off the wall in sections the size of the windows to see how we wanted the windows hung and how we wanted them to be spaced on the wall. We then secured any loose parts on the windows, we wanted them to be shabby, but not fall apart on our guests. Different steps for each window. We polyurethaned the windows so that the paint would not chip off of the window. It would also be wise to caulk the glass in your windows if you find that any are loose. We attached picture hangers on the back of all of the windows that were appropriate for the weight of the windows. One picture frame holder for each window. Using a tape measure, level, and screws we hung the windows as level and straight as possible. This is hard when you are working with rustic materials because there are flaws as you can see, but we tried to keep them as similar as possible. We put nails in the wall behind the windows to secure them from being able to move back and forth if anyone were to bump them. 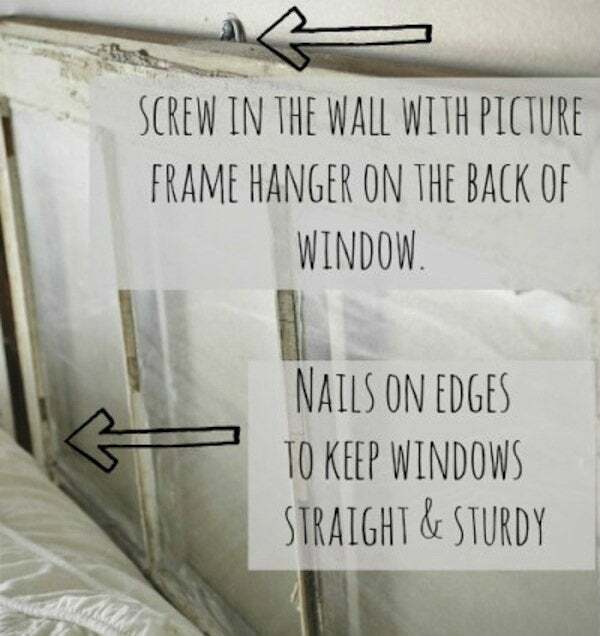 Also this step straightens out your windows if they are hanging a little crooked. We have actually had guests stay in this room already and I was so excited to ask them the morning after they slept in the room if the windows bothered them at all or if anything. They said they were perfect and didn’t effect them at all. Thanks to Liz Marie Blog for sharing! To check out more of her DIY projects and get the home tour, visit her site.